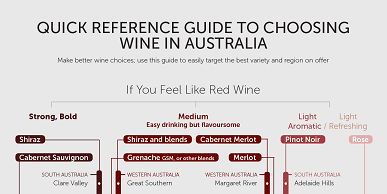 A major problem is how to store open wine in a bottle without losing all the wonderful aromas and flavours contained within. Beyond about 3 days the wine can become dull and lifeless. What a waste! While I think the best solution is the Repour wine saver, I think it is worth considering other approaches that are just as simple and affordable. So let's look at gas injection from an aerosol can. 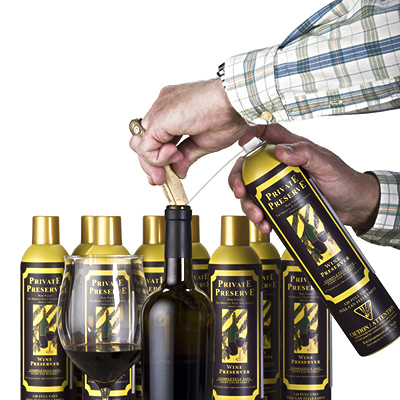 Enter: Private Preserve – this wine preservation gas is a simple way to add a layer of non-reactive, non-toxic and environmentally-friendly gas above the surface of the wine in a bottle that has been opened. It is a blend of nitrogen, carbon dioxide and argon (all found naturally in the air we breathe) which can prevent oxidation of wine (spoiling from oxygen). The Private Preserve can comes with a thin tube that is inserted into the bottle so the protective gas can be squirted into the air in the bottle above the surface of the wine, forming a layer. The gas is heavier than air, so it will push out most of the air in the bottle and sit on top of the wine, preventing oxygen from coming in contact from the wine. The gas is non-toxic and won’t react with the wine. I like this solution because of its simplicity – there are virtually no moving parts, fittings, replacement parts or expensive gear. Just a can with a tube attached. I have been using it whenever I open a bottle (I previously used a vacuum device). I have found it roughly doubles the life of an open bottle, compared to just opening it and using the screw cap. Previously, I would get three days of freshness from a full-bodied red wine I would open and just replace the screw cap, but if I use the Private Preserve gas, the wine stays in pretty good shape for up to a week (less if it is being opened every day). One thing that is a bit strange when using it for the first time is that the can feels completely empty when it is brand new. That’s because it contains gas under pressure but no liquid (most aerosol cans contain liquid with a gas propellant as well). Once you get used to the light weight of the can, you’ll find it works for a surprisingly long time, if you only use short bursts of gas. To use it, just insert the thin tube into the nozzle on the can. Then put the other end of the tube into the bottle just above the level of the wine (it doesn’t need to be too close to the wine – just in the middle of the space in the bottle is fine). Hold the cork or screwcap so that it covers as much of the mouth of the bottle as possible – this helps prevent the gas from coming straight back out of the bottle. Then spray three short bursts of gas into the bottle and replace the cork or cap onto the bottle. That’s it! The gas will settle down to form an invisible blanket over the wine, protecting it from oxidation. Store the bottle upright to minimise mixing of gases with the wine (there may be a little oxygen left in there but it should be displaced to just above the protective blanket of gas). Storing it upright will also minimise the surface area of the wine, which will help prevent any oxygen getting to it. This article in Decanter Magazine and this article in Wired Magazine compared it favourably against other approaches for keeping wine fresh. Private Preserve is available from a local seller on Ebay Australia for under AU$30 with free delivery -click here to go to the product page on Ebay. Or if you prefer, you can purchase it for about the same price with free delivery from Amazon Australia - click here to view. (Please note: these are affiliate links, which means Wine Wisdom Made Easy will be paid a commission for all sales of Private Preserve, to help support this site. This will not affect the price of the item – its listing price is the same, whether you find it via this website, or a Google search, or any other way – I just wanted to be 100% upfront about that). I hope you get as much value from Private Preserve as I do. Feel free to get in touch and let me know what you think!